Today my husband prepared some beetroot juice for me with little help from me which entitles me to add it into this blog. I have had beet soups still not really the beet juice; usually beet juice is mixed with carrot juice for some reason but he made with plain beets. It had a very dark purple color and was dense in flavour. 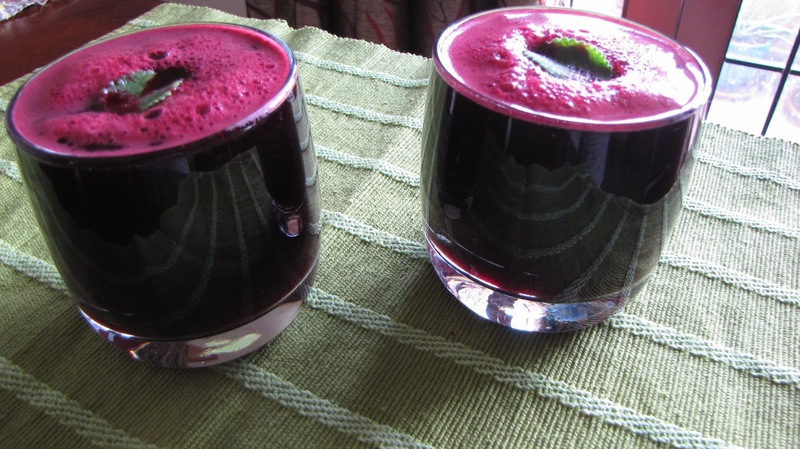 Beet juice is said to have treasures of minerals and is beneficial for blood. It looked so glamorous and tasted good. Step 1: Wash, peel and cut the beet roots into cubes. Step 2: Using a juicer or a mixer jar extract juice from the vegetable. Strain it well if you are using mixer jar. Step 3: Chill it in refrigerator, better not to use ice cubes. Step 4: Add salt, cumin powder, pepper and mix well and pour into serving glasses. Step 5: Garnish with mint leaves if you’ve.